We’d love your help. Let us know what’s wrong with this preview of A Night in Grosvenor Square by Sarah M. Eden. To ask other readers questions about A Night in Grosvenor Square, please sign up. Every time I read a new anthology in the Timeless Romance anthologies line I think, "I have a new favorite, they can't get better than this one." Well this one is definitely a new favorite. I have honestly enjoyed every anthology that I have read. You can't go wrong with great authors coming together to write clean, sweet, witty, swoony and unputdownable stories covering many different topics. And even better, this collection has all three of the original creators of this line contributing a nov Every time I read a new anthology in the Timeless Romance anthologies line I think, "I have a new favorite, they can't get better than this one." Well this one is definitely a new favorite. I have honestly enjoyed every anthology that I have read. You can't go wrong with great authors coming together to write clean, sweet, witty, swoony and unputdownable stories covering many different topics. And even better, this collection has all three of the original creators of this line contributing a novella. They were fabulous. Once I started I did not want to set this one down. I think I giggled and sighed...well I know I giggled and sighed many times. Hee Hee! All the stories are set in Regency time but let me tell you that they are not at all the traditional regency stories. I loved the originality of these three novellas. Content: Clean. Moment of peril but nothing overly graphic. If you're a fan of these anthologies I highly recommend reading this one. If you haven't discovered these anthologies yet and love great clean romance, I highly recommend you go peruse them and pick one that appeals to you. But be warned, once you start you might not be able to stop reading these. I received a copy from the publisher. All thoughts and opinions in the review are my own. LOVED it! This is the latest in the Timeless Regency series. I like that there's only 3 stories so they're longer and the stories all feel complete and not rushed to an ending. Miss Odette Armistead is in love with someone, so to fend off unwanted suitors during the Season she puts on airs, etc and earns herself the title Princess Pompous. Much to her dismay her parents have brought in a matchmaker, Adelaide Northrop, to find her a husband by the end o LOVED it! This is the latest in the Timeless Regency series. I like that there's only 3 stories so they're longer and the stories all feel complete and not rushed to an ending. Miss Odette Armistead is in love with someone, so to fend off unwanted suitors during the Season she puts on airs, etc and earns herself the title Princess Pompous. Much to her dismay her parents have brought in a matchmaker, Adelaide Northrop, to find her a husband by the end of her season. Young people in love often do silly things that make matters worse and this is a prime example of that. I love Sarah Eden's writing and the characters she creates. I like Miss Northrop and how her trained matchmaking eye figures out who Odette is in love with and then helps to undo the damage Odette and her beloved have done so that they can be together. Anne Preston works at Gunter's Tea Shop decorating cakes, making candy, ices, and ice cream molds for those in the upper class. She lives in a boarding house saving all she can so that one day she can open up her own shop. One day David Whitledge, an American businessman, comes in and her world is never the same. David tries to help Anne, but not fully understanding England's strict division of classes unwittingly makes things worse for her. I'm so happy I didn't live in this time in history when classes were so strictly divided and the working class barely got by on their wages, and could be turned out without a reference for inconsequential reasons. Anne is a hard worker who doesn't see her own beauty, but David does. I loved that he tried to help her but knew as I read that it wouldn't turn out good for her. Of course he comes up with a lovely solution to her situation and her dream of owning a sweet shop. Ellen Humphreys has never had a Season and thanks to her mother she doesn't think she ever will. Ellen has her own "Little London" on their country estate where she pretends she's at a ball and dancing with handsome young men. Quinn Edwards, the Marquess of Kenworth, comes upon her which leads to an interesting situation(s). I felt so bad for Ellen. Her mother sounds like a hypochondriac who i think might have a mental issue after one particular scene. (lol) Thank goodness for her aunt Prudence who arranges for her to have a Season. I really like Quinn and his brother, but their meddling mother has to go. Thankfully Quinn found his backbone and dealt with her. I love that this story has an epilogue and fast forwards to a year later. Each one of these stories is utterly delightful! The common factor is Grosvenor Square--a very prestigious area of London. I think what really charmed me is how each story told a different angle of people living in these times and how they would relate to this place. A MATCH FOR PRINCESS POMPOUS gave the reader a tale of a secret. "Matchmaker, matchmaker, make me a match..." I haven't really read a story where a matchmaker is employed and wow, is she good at what she does. I loved the secret and Each one of these stories is utterly delightful! The common factor is Grosvenor Square--a very prestigious area of London. I think what really charmed me is how each story told a different angle of people living in these times and how they would relate to this place. A MATCH FOR PRINCESS POMPOUS gave the reader a tale of a secret. "Matchmaker, matchmaker, make me a match..." I haven't really read a story where a matchmaker is employed and wow, is she good at what she does. I loved the secret and although the way it came about is a little heartbreaking, it definitely provides some great entertainment. CONFECTIONS AND PRETENSE is all about one of my favorite treats--ice cream. A working-class girl, an American, and delicious descriptions of unique flavors of this creamy treat all added up to an endearing story. Anne is a darling and Davis is swoon-worthy. What do you do if you aren't allowed to socialize? Why, you come up with your own LITTLE LONDON. Ellen and Quinn's story is the icing on the cake of this wonderful collection. I loved the little descriptions of society and the way the little character variances and preferences added some chemistry, especially when some backbones were grown. I loved my time spent in Grosvenor Square and each offering really encompassed a wide range of situations and people. This is another great book by these beloved authors. Content: mild romance; mild violence (Confections and Pretense). This is Sarah Eden at her finest! I love when she writes these light, charming regencies. The plot for this one was so fun, I loved the idea of a regency Matchmaker and Mrs. Adelaide Northrop does a great job matching couples all over England. I sincerely wish Ms. Eden would write a whole series based on Mrs. Northrops adventures in matchmaking! I really enjoyed this one, even though its a shorter story, it felt well developed and the pacing was good so in the end I felt I had read a complete and satisfying story. Delightful! I love the Timeless Regency Collections! I’m always excited when a new one comes out, but this one had me even more excited than usual. I love all three of these authors! I couldn’t wait to see what they had in store for me! A Match for Princess Pompous by Sarah M. Eden – I love Mrs. Northrop! It is fun to watch her in action! I loved her desire to help people find true happiness. And I wanted Jack and Odette to find happiness! They were such great characters! Their devotion to each other was so I love the Timeless Regency Collections! I’m always excited when a new one comes out, but this one had me even more excited than usual. I love all three of these authors! I couldn’t wait to see what they had in store for me! A Match for Princess Pompous by Sarah M. Eden – I love Mrs. Northrop! It is fun to watch her in action! I loved her desire to help people find true happiness. And I wanted Jack and Odette to find happiness! They were such great characters! Their devotion to each other was so sweet. I also really liked Terrance. Confections and Pretense by Annette Lyon – This Regency novella was a little different. It was a nice change to have a hard working heroine, who still holds on to her dreams. And Davis, our hero, is American. I really liked both Anne and Davis and their inherent goodness. It was interesting to see some of the differences between what was acceptable in England vs. America, and how that influenced what happened. I loved the ending! Little London by Heather B. Moore – I loved this novella! Ellen is a breath of fresh air. I can just picture her dancing in her meadow. It provided the perfect backdrop for a very romantic meet. I loved the role Quinn’s brother played in everything. And there is the sweetest epilogue!! The Timeless Romance collections are my favorite way to escape! I just read the stories one right after the other. It's like having a box of See's Candy chocolates all to yourself... I enjoyed each of the stories- the characters that come to life so quickly, the amazing Regency setting, the satisfying plots that can be devoured quickly. Once again, each story is unique even though they share the theme of Grosvenor Square, and it was fun to see how they each tied it in. I loved the knowing matchm The Timeless Romance collections are my favorite way to escape! I just read the stories one right after the other. It's like having a box of See's Candy chocolates all to yourself... I enjoyed each of the stories- the characters that come to life so quickly, the amazing Regency setting, the satisfying plots that can be devoured quickly. Once again, each story is unique even though they share the theme of Grosvenor Square, and it was fun to see how they each tied it in. I loved the knowing matchmaker in Sarah Eden's story and hope to see her in some future novellas! In Annette Lyon's story we learn more about the famous Gunter's Tea shop and the history was fascinating. I liked that there was an American that flouted the strictures of the ton when he befriended Anne. The last story by Heather B. Moore was my favorite since I felt like it had the most romance ;) Ellen's imagination was endearing and the way she and Quinn met was so lovely. It was fun seeing how they reconnected amid her embarrassment and his attraction and the way Quinn's brother helped their relationship progress. I'm lucky this is a written review, because I am having a devil of a time spelling, let alone pronouncing Grosvenor! All that aside, this was another fun collection. Each story was short enough to finish in one sitting, if I was lucky enough to read uninterrupted, yet each story was well fleshed-out. This was my favorite story in the collection. Mrs. Adelaide Northrop is widowed and has quite the skill as a matchmaker. Her companionship is requested when t I'm lucky this is a written review, because I am having a devil of a time spelling, let alone pronouncing Grosvenor! This was my favorite story in the collection. Mrs. Adelaide Northrop is widowed and has quite the skill as a matchmaker. Her companionship is requested when the elite need help marrying off their sons or daughters. Miss Odette Armistead has never heard of her until Mrs. Northrop is engaged on her behalf. Odette's parents think her behavior this season has been deplorable, what they don't realize is that Odette was acting a part on purpose. With Mrs. Northrop's skills of observation and wit can she untangle the mess that her charge has made, and give everyone a happily ever after? I loved this story, from Mrs. Northrop's wry observations and humor, the impulsive plans of the young and in love, and the superior way that Mrs. Northrop can manipulate the ton. I hope to see Mrs. Northrop playing puppet-master to more of the English elite! This was an interesting look into Gunther's. I have read about this iconic location in London before, and fantasized about going there for ices. After reading about the flavors (rose, violet, jasmine, orange blossom, coriander, Parmesan cheese, and artichoke) I might be backpedaling on that fantasy. I think I will keep our modern day ice cream! Anne Preston works at Gunther's making the ices, decorating cakes, and occasionally delivering them. While working she meets an American, Davis Whitledge. I loved the way that Davis was always trying to protect Anne, and I loved her independence, in a time where women were rarely given that opportunity. Ellen Humphreys lives in the small village of Harpshire. Her mother is sickly, overly dramatic, and reclusive, this leads to a very sheltered existence for Ellen. Ellen escaped to a meadow each day to dream. One day while imagining a ball, and addressing a fictitious Lord Edwards, Quinn Edwards, who does happen to hold the title Lord, walks by and overhears her. What follows is an adorable and memorable meet-cute. I loved the way that they were both smitten, and the different reactions they each had to their meeting. The journey was rough, but the resolution was sweet. I loved seeing Ellen and Quinn triumph, and imagine them taking London by storm! Three stories in this book that were hard to put down... So I didn't and stayed up wayyyyy too late!!! The first & third were my favorites but I definitely enjoyed all. Clean romances, wonderful characters and commanding women. Highly recommended! I loved this collection of stories. One thing they all had in common, not everything was as it seemed. The characters were of the ton, and of the lower class. They were all wonderful characters. I liked each and every one of them. 3 Great Clean Regency reads. The 2nd was Annette Lyon Confections and Pretense. This was a good story but was just too wordy. Having a short story feel like it's dragging is never a good thing. It was sweet and pulled at the 3 Great Clean Regency reads. The 2nd was Annette Lyon Confections and Pretense. This was a good story but was just too wordy. Having a short story feel like it's dragging is never a good thing. It was sweet and pulled at the heart and I loved the way it ended. A lovely collection of Regency novellas. I definitely could not pick a favorite! Even though the stories are short, there is plenty of opportunity to fall for the characters and their sweet stories. I also liked the variety: in the first story there's a "professional" matchmaker that helps the couple get together; in the second, there's a handsome American hero who saves the heroine, in more ways than one; the last story has a very whimsical beginning. I received an ebook copy, A lovely collection of Regency novellas. I definitely could not pick a favorite! First, I want to remind you that I don't review a book if I didn't genuinely enjoy it. Here's why - I don't want to spend more time thinking about a book if I didn't like it and so I won't review it. I mean, I read a lot of books and if a book is just ok or if I liked it but didn't finish it wanting to share it, then I usually don't. That said, I review a lot of books. I may be easy to please, but I also really enjoy reading and want others to be able to enjoy reading - and reading a good book! First, I want to remind you that I don't review a book if I didn't genuinely enjoy it. Here's why - I don't want to spend more time thinking about a book if I didn't like it and so I won't review it. I mean, I read a lot of books and if a book is just ok or if I liked it but didn't finish it wanting to share it, then I usually don't. That said, I review a lot of books. I may be easy to please, but I also really enjoy reading and want others to be able to enjoy reading - and reading a good book! I really think you'll enjoy this one. I loved it. Seriously. The first novella - "A Match for Princess Pompous" is about a matchmaker up against what may be her greatest challenge yet - a young woman nicknamed "Princess Pompous" by the elite in society. This one made me so happy. It is not surprising to me that it is by Sarah M. Eden. She never disappoints - her writing is always fantastic and this one was no exception. It was so different. and I want to read so many more stories about Mrs. Northrop and her matchmaking experiences. What a breath of fresh air to a reader of *ALL* of the Timeless Collections. Worth the read of the whole book just to read this one story. Though, truth be told, the whole collection is exciting. Annette Lyon is another long time favorite of mine. "Confections and Pretense" was a dream to read. The perfect story for sitting inside on a story day and getting into. The characters were given life through their engaging dialogue and honest introspection and the story flowed so naturally it seemed real. I have not met a book in the Timeless Regency Collection that I hated. This collection of Regency novellas was no different. Each one was fun and added to the theme of the book. Plus, I love each of the authors in this set. I thoroughly enjoyed A Match for Princess Pompous. Everyone loves a good match maker story. Adelaide cracked me up! I love she did not put up with Odette’s bad attitude and always kept an eye out for the not-so-obvious feelings. I would love for the author to write more about I have not met a book in the Timeless Regency Collection that I hated. This collection of Regency novellas was no different. Each one was fun and added to the theme of the book. Plus, I love each of the authors in this set. I thoroughly enjoyed A Match for Princess Pompous. Everyone loves a good match maker story. Adelaide cracked me up! I love she did not put up with Odette’s bad attitude and always kept an eye out for the not-so-obvious feelings. I would love for the author to write more about Adelaide. She is a fun character. In Confections and Pretense, I found Anne very interesting and fun. I enjoyed her ice cream art. Of course she cannot help herself when it comes to Davis. He is her hero. A super fun story. I seriously laughed out loud in Little London. I was completely embarrassed for Ellen many times and cheered her on. Seriously this story was so cute and super funny. Quinn is a sweetheart who waltzes right into Ellen’s heart. A fun Regency read. Fun for all ages! *Please note I received a complimentary copy of this book. All opinions expressed are my own. I've been looking forward to this book for quite a while! These Timeless Collections are some of my favorites and I always know when a new one comes out I am in for a treat. In the first book, Adelaide the matchmaker had a slightly magical quality about her. I loved the way she could "see" I've been looking forward to this book for quite a while! These Timeless Collections are some of my favorites and I always know when a new one comes out I am in for a treat. A Match for Princess Pompous by Sarah M. Eden - 2.5 ⭐ I didn’t feel any chemistry between the h and H. This is the first book by Sarah M. Eden that I didn’t like. Confections and Pretense by Annette Lyon - 2.5 ⭐ I really enjoyed the romance but I just can’t suspend my disbelief at some parts. Little London by Heather B. Moore - 3.5 ⭐ Pure fluff. I don’t usually like a story with love at first sight but the characters are thankfully sensible about it. A Match for Princess Pompous by Sarah M. Eden - 2.5 ⭐️ I didn’t feel any chemistry between the h and H. This is the first book by Sarah M. Eden that I didn’t like. Confections and Pretense by Annette Lyon - 2.5 ⭐️ I really enjoyed the romance but I just can’t suspend my disbelief at some parts. I always look forward to the Timeless Regency Collections and this one did not disappoint. It is one of my favorites. I loved all the stories and appreciated how different each one was from the other. I loved, loved, loved this short story. I didn't want to put it down. It held my full attention from start to finish which is saying a lot with the reading mood I am in. I loved the characters and the matchmaking storyline. This was an enjoyable nov I always look forward to the Timeless Regency Collections and this one did not disappoint. It is one of my favorites. I loved all the stories and appreciated how different each one was from the other. This was an enjoyable novella with an older hero and heroine which is not the norm and I appreciated that. It was a nice change. I really liked Quinn and Ellen. I enjoyed their story. It was definitely instalove but it worked for me. I liked all the characters and would love a story about Quinn's brother Robert. A Night in Grosvenor Square (2018) is an EXCELLENT collection of novellas by Sarah M. Eden, Annette Lyon, and Heather B. Moore. This anthology is part of the Timeless Regency Collection published by Mirror Press, and was just released on January 23, 2018. This book is available in all forms including eBook, and is 320 pages in length. 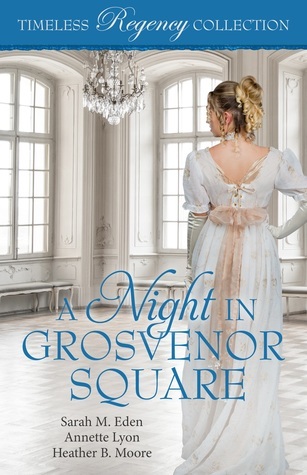 This collection reads as a stand-alone; it is not necessary to read any of the other books in the Timeless Regency Collection series to understand the stories in t A Night in Grosvenor Square (2018) is an EXCELLENT collection of novellas by Sarah M. Eden, Annette Lyon, and Heather B. Moore. This anthology is part of the Timeless Regency Collection published by Mirror Press, and was just released on January 23, 2018. This book is available in all forms including eBook, and is 320 pages in length. This collection reads as a stand-alone; it is not necessary to read any of the other books in the Timeless Regency Collection series to understand the stories in this anthology. With a full-time job and an exceptionally precocious five-year old at home, this novella series took me less than 24 hours to devour!!! I received a copy of A Night in Grosvenor Square in eBook form from the publisher to review. In no way has this influenced my review. The opinions expressed in this review are my own. I give this novella collection 5 STARS. This collection is a Clean Historical Romance series. "A Match for Princess Pompous" is an EXCELLENT novella. I loved every second of this story. The plot line is highly engaging, the characters are very well crafted, and the ending is endearing. When this story ended, I wanted more! Imagine Mary Poppins as a matchmaker in Bath, England in 1810, and you'll sort of get an idea of what this story is about. Adelaide Northrop, a well-known and highly sought-after matchmaker, swoops into the upper-crust families of England in order to help them secure advantageous matches for their children. What I like most is that Mrs. Northrop is more interested in securing happy futures for the children, rather than bending to the whims of the greedy, socially-minded, arrogant parents. Mrs. Northrop is like a mentalist -- she expertly reads any room she walks into and ascertains her clients' secrets in mere days. Her current task is to secure a match for Princess Pompous herself, Miss Odette Armistead. Odette has gone out of her way to seem aloof and standoffish much to the disdain of Society. BUT, things are not as they seem and Mrs. Northrop is determined to unravel the mystery as to why Odette is choosing to act so contrary to her actual temperament. "Confections and Pretense" is a sweet story that had a couple of real tense moments I didn't expect. Anne is the main character, and she works at Gunter's Tea Shop making beautiful ice creams and cakes and other confections. She is amazingly talented, and she dreams big of one day moving to America and starting a sweets shop of her own. Anne meets Davis, a very handsome, wealthy, and admirable American man. Anne ends up in a little trouble and Davis heroically comes to her aid. I really enjoyed this story. Of the characters, I felt for Anne the most. She is 31, completely alone, and poor. But she dreams big and labors hard in the hopes that one day she will achieve her dream. Anne really niggled her way into my heart. She felt small and invisible, but she has so much strength and presence. I was rooting for Anne the entire story, and really wanted her to get her happily ever after. Davis is an excellent hero. He is handsome, vulnerable, and always willing to save the damsel in distress. I really liked how almost immediately he felt compelled to protect Anne. I found that trait to be exceptionally endearing because it reminded me of my sweet husband. I absolutely LOVED, LOVED, LOVED "Little London"! It has everything I need in a clean romance. There is Ellen, the beautiful but isolated heroine who dreams of one day dancing with her prince. There is Quinn, a handsome marquis longing for freedom from Society's expectations and husband-hunting daughters. There are two mothers bent on dictating every step their children take, which is exceptionally frustrating! And, there is a clandestine meeting between Ellen and Quinn that really set this story off on the right track. "Little London" is a magical reading experience. I rooted for Quinn and Ellen the entire time. There were a couple sticky moments I wasn't sure how the couple would maneuver through, but all things eventually work themselves out. Of the three stories, this story's ending was the most satisfying, and I closed the book with a very BIG smile on my face. I love happily ever afters, and this short story delivers a happily ever after for Ellen and Quinn that does not disappoint. There are three regency style novellas in this book. I enjoyed them all but like Eden's story the best. 1810, Adelaide Northrop is a match maker for the ton. She is quite busy during the Season and is just finishing up a case in Bath when she is whisked away to London to save Lord Barrington's daughter's season. She has been labeled Princess Pompous and the ton can't stand her. Odette Armistead, is rude, assuming and naughty towards those she should be impressing. Her parents aren't sure what to do and as a last resort, have hired Mrs. Northrop. Jack Hewitt, is also in the thick of his season with Odette. Their families have known each others for many years but are promised to other people. But Odette and Jack have never seen the likes of Mrs. Northrop. She loves a challenge and these two definitely challenge her. Confections and Pretense by Annette Lyon: London, Summer 1825. Anne Preston has no family and is an old maid. She struggles to make ends meet for herself. She lives in a boarding house and walks to her job where she makes ice cream cakes in Gunter's Teas Shop. She works hard but cannot change her station, even though she wished for more. "Yet she often reminded herself that she had a much easier life than many old maids in similar situations, without family, connections, or money." A chance encounter with Davis Whitledge, an American, creates problems for Anne when she is accosted by nearby hotel livery workers. Davis becomes very interested in Anne and looks to find more about her. Anne tries to avoid him because of her station but as an American, Davis doesn't have the same principles. The question becomes, how will the two connect? Harpshire Village, 1826. Ellen Humphreys lives in a small town in Regency England. Her mother has become a recluse and her father runs a merchant business out of London. He travels a lot, leaving Ellen with her mother and governess. An accidental meeting with Quinn Edwards, the Marques of Kenworth, intrigued Ellen but now that she has been offered a season by her aunt, she is scared to go to London, fearing she will run into the Marques. Ellen ends up going to London and becomes the talk of the town. She is quite popular with the gentlemen and this creates jealousy with the ladies and Quinn. This wasn't my favorite of all the stories. The ending was highly unlikely...even more so than this story being real. Overall, the first story had me wanting more. I really liked Mrs. Northrop. She is a mysterious character. I wish Eden would expand to create a novel about Mrs. Northrop. I don't need a romance for her, even though I wonder... I would read about more cases that come her way. She is a very entertaining character. The ending of the second book had me wanting more also. I felt like their story wasn't over. It was interesting to see the ton in a new light...that of the working class and an American perspective. The third book was not a favorite of mine. I enjoyed the first half of the story but the ending had me going yeah right. I loved this collection of short stories! Adelaide Northrop is a matchmaker who helps family of the ton find matches for their daughters. Everyone thinks she has her work cut out for her when she is asked to help find a match for Odette Armistead, but it doesn't take Adelaide long to figure out why Odette (also known as "Princess Pompous") is acting the way she is. I would love for there to be more books about Adelaide and the matrimonial magic she work I loved this collection of short stories! Adelaide Northrop is a matchmaker who helps family of the ton find matches for their daughters. Everyone thinks she has her work cut out for her when she is asked to help find a match for Odette Armistead, but it doesn't take Adelaide long to figure out why Odette (also known as "Princess Pompous") is acting the way she is. I would love for there to be more books about Adelaide and the matrimonial magic she works. Anne Preston works in a safe, fashionable neighborhood and has dreams of one day opening her own sweets shop in America. When she meets the American Davis Whitledge, her life is never going to be the same. There are a couple of villains who almost ruin any happily ever for Anne. Ellen Humphreys of Harpshire lives with her reclusive mother. There is a meadow by her house that she has named Little London where she goes to dream of the Season she will never have. One day Quinn Edwards, the Marquess of Kenworth, passes by her meadow while she is playacting and teaches her how to waltz. She makes an impression on him that he can't easily forget. A Night in Grosvenor Square was a enjoyable read. Although it is not my favourite of the collection, the stories were sweet and agreeable to read. Usually, I find that the anthologies of Timeless Collections order the stories in each book from good to best - I am usually always happy with that as my favourite story is always the one I end with. However, this time, my opinion was more balanced as I did not have a real favourite. All three novellas were good, but perhaps a little precipitated - I don A Night in Grosvenor Square was a enjoyable read. Although it is not my favourite of the collection, the stories were sweet and agreeable to read. All three novellas were good, but perhaps a little precipitated - I don't like when characters fall in love at once, before even knowing each other very well. I found they also "thought" a lot: about the other, about do I really like him/her? Should I marry him/her? etc... Whereas I prefer when books are filled by dialogues between the two main characters, it is more lively, fun, and heart-warming. Three love stories (1) A Match gorgEousness Pompous: The love story of Jack and Odette. Jack and Odette come up with a plan to stop her from finding a husband, she is to be very unfriendly to all. Odette's parents hired a matchmaker to find a husband for her. And the fun begins. 2. Confections and Pretense : The love story of Ann and Davis. Ann is a ice cream maker at Gunthers ' I've when she meet David , an wealthy American. He rescue her and he fall in love with her. Can their two world come together? I enjoyed every one of these stories. The three authors are among my list of go to authors and it would be hard to pick a favorite of the three. I believe this book is a perfect addition to the wonderful series, Timeless Regency Collection. I highly recommend it and give it 5 stars. I received this book from the authors, but was not required to write a review. This review is 100% my own honest opinion. This was a beautiful collection! I love these authors! Sarah is always fun and makes me giggle! I loved the match-maker!! !Annette is always poignant and worthy of reflection and i want to see the cake!! And Heather’s work was outstanding! I fell in love with Quinn! Probably one of my favorites of hers! All three were swoon-worthy and happy! What a delightful read! Enjoy! All the stories are well written and enjoyable. I loved the theme of Grosvenor Square. Three ho hum stories. Time fillers if your stuck in the doctors office or motor vehicles. Cute but nothing you hate to put down when they finally call your name. I’m giving this a 3.5 star rating. I really liked the first and the third stories. They were great. I didn’t really like the second story. That’s why I gave the lower rating. With a lot of sadness and illness in my life lately I needed a quick read that would pep me up. I needed a story that I could finish with a smile on my face instead of tears in my eyes. I enjoyed reading Falling for a Duke so much that I decided to pick up another volume in the Timeless Regency Collection, A Night in Grosvenor Square. Like all of the books in the series, A Night in Grosvenor Square includes three short stories by three different authors. I was especially excited to pick up this With a lot of sadness and illness in my life lately I needed a quick read that would pep me up. I needed a story that I could finish with a smile on my face instead of tears in my eyes. I enjoyed reading Falling for a Duke so much that I decided to pick up another volume in the Timeless Regency Collection, A Night in Grosvenor Square. Like all of the books in the series, A Night in Grosvenor Square includes three short stories by three different authors. I was especially excited to pick up this volume because all three authors are original authors to the series, plus one is one of my new favorite authors, Heather B. Moore. What is charming about this collection is that each story features a scene that occurs in Grosvenor Square in London sometime in the early 1800's. A Match for Princess Pompous is a story of a widowed matchmaker in 1810 named Adelaide. Instead of being concerned with her own love life, Adelaide chooses to focus on helping other women find their true love and the more challenging the case the better. No case is more challenging than that of Odette Armistead, otherwise known as Princess Pompous. Odette has a reputation in London for being one of the most disheartening maidens, but what no one knows is that she has purposely acquired this title. The truth is that her, and the man that she loves, Jack Hewitt, planned this for the Season, so that once it was over, they hoped, they could tell their disagreeable parents, and finally be together. Their plan is faulty from the start, and really falls apart when Odette cannot fool the matchmaker! When I first started reading I had an ideas about where the story would take me and, though predictable at times, I liked how it all turned out. I must admit that I grew a little bored with the story of Odette and Jack, and the predictability, and actually would've loved to have seen more from Mr. Lexington (Jack's best friend) and the shy Ms. Summerfield, but I also understand this is a short story, emphasis on short. I did enjoy the story and found it over charming. This is the first time I've read any of Sarah M. Eden's work but I really liked her writing style and how she brought her characters, and this time period of London and Society, to life. Confections and Pretense felt a lot like a Cinderella story to me. Anne Preston has lived a hard knock life. She has no family, lives in a boardinghouse in London in 1825, is thirty-one, considered an "old maid," with no hopes of ever getting married. She is lucky enough to work at Gunter's Tea Shop, an ice cream shop that is in a nicer London neighborhood, serving members of the ton. Anne pours everything she has into her job, slowly saving every cent, so that she can hopefully one day open her own ice cream shop in America. Anne is a daydreamer, so when she meets a distinguished, older American man, her imagination runs wild, especially after he rescues her from what could've been a very bad situation. Little does the charming American, Davis Whitledge, know but he actually put Anne in an even worse predicament than either of them could've ever imagined; a matter of life and death. Out of all of the stories, I would have to say that Confections and Pretense was my favorite. The plot did not lead where I thought it would and the ending actually gave me goosebumps with its twist ending. My heart felt for sweet Anne and her plight and I found myself rooting not only for her to find love with Mr. Whitledge but also to find a way out of her "societal rules," and able to pursue he dreams. Annette Lyon is also a new author to me, but I love her style of writing, and want to find books from her to read. Little London was the story that I had anticipated by Heather B. Moore and was surprised it wasn't my favorite. It is the sweet story of Ellen Humphreys and Quinn Edwards, and their chance encounter in a small meadow near Harpshire Village, a small town on the outskirts of London, in 1826. Ellen is a country girl and Quinn is the Marquess of Kenworth, a title that he does not wish to bestow, but has grudgingly held since his father's passing a few years back. After Quinn and Ellen's parley in the meadow, they each know, due to their unequal status in Society, that they can never be together. As the story unfolds, events transpire, and characters come into play, and makes each of them both second guess everything they know. Little London has its predictability (as most love stories in this series do) but it was an engaging read. What I loved the most was the epilogue at the end of the book. I hate when certain stories end and you're left to wonder where the characters ended up. With Little London, you do not have to worry! Heather B. Moore always does a wonderful job of character development, and this short story does not disappoint. Just like the other books in the Timeless Regency Collection the stories are short, sweet, with little twists and turns and drama mixed in here and there. I enjoyed my time in early 1800's London and I'm sure you will too. How much I love reading these fun and endearing collections! This one marks another great one with wonderful and diverse stories. This time the common denominator of the three is the famous Grosvenor Square. Even though this location was known to be the stomping ground of the elite of the time, we still get to meet all the classes of society of London in the 1800s. I think that my overall rating for the collection would have to be 4.5/5 stars (but I have to confess, my hearts leans towards 5/5 stars), only because I think one of stories could have held so much more if it were fuller. Unlike most stories in the Timeless Romance collections, in this story we don’t have just two points of view- we have three. The third point of view belongs to Adelaide. Adelaide is a professional matchmaker, and a very good one at that. She was hired by Odette Barrington’s parents to try and salvage their daughter’s season since she became known as Princess Pompous all throughout London. When Adelaide meets Odette, she quickly realizes that Odette is doing everything she can to cling to her new moniker on purpose. She just needs to figure out why? A very different take on the social customs of the period, this novella brings a fresh outlook on the struggles young people had to face before finding their match. Here we meet Anne Preston, a cake maker and an ‘old maid’ of about 30 years, who dreams of opening her own sweets shop, preferably in America. One day Anne meets a charming American that just won’t leave her mind and fantasies from that moment on. What she doesn’t know is that the same is happening to him as well. This story deserves to be worth more than 4 stars, I so wanted it to be a five stars story! I think that if it were longer, or better yet a full novel it would have been amazing. The pacing was just too quick for me, I wanted it to develop more fully and slowly, but being a short story everything moved in fast forward. I also loved that we got a glimpse into the seedy part of London at this time period and how different and difficult were the lives of those who weren’t born lucky. I want this to be remade into a full novel please! In the concluding novella we meet Quinn Edwards and Ellen Humphreys. Ellen lived in the countryside with almost no company to speak of almost her entire life. Because of that she became fond of daydreaming in her favorite meadow about attending balls and assemblies and meeting her Prince Charming. Little did she know that one day a real marquees will accidentally find her dancing by herself in her meadow. Quinn was on his way to see his mother when he thought someone called his name in the seemingly empty forest he was traveling through. When he tried to investigate, he stumbled upon a young lady dancing and humming by herself. He could have never suspected that this chance encounter would change his life. Ellen imagination was so refreshing and reminded me so much of Anne Shirley’s I couldn’t help but smile.